Typically, investors tend to shift funds to fixed income when equity markets are not doing well (as it happened last year) and vice-versa. But these are good times in our capital markets, when complementary asset classes—fixed income and equity—are in step with each other and are both giving attractive returns. Some experts suggest that this trend could dominate most of this calendar year. So does this mean you should invest in hybrid funds, such as monthly income plans or MIPs, which are debt-oriented products with marginal exposure in equity? In hybrid funds such as MIPs, both asset classes—fixed income and equity—can be managed actively to take advantage of market dynamics. Though most experts we spoke to believe it’s a good time to invest in this product, they also maintained that it’s not worth timing an entry into such products as any time is a good time to start long-term investments. Foreign institutional investors (FIIs) have so far invested nearly $5.57 billion (Rs. 27,293 crore) in the domestic equity markets. If the positive expectations on monetary easing and government policy action come through, the impact on earnings and industrial growth will happen with a lag; better performance from Indian companies and pick up in manufacturing growth can possibly be seen in the second half of 2012. According to a February 2012 fund manager survey by ICICI Securities Ltd, 82% fund managers believe earnings growth for FY13 will be 10-15%. The survey also showed that 76% believe equity markets will rally another 5-10% from here. Fixed income: Across products, fixed income has done well through most of 2011, thanks to high interest rates. Investors in fixed deposits, liquid and ultra short-term funds and even corporate bonds are looking at annual returns in the range of 8-10%. The other side of fixed income is trading in bonds, where returns can be positive in a declining rate environment. Bond prices rise when rates fall. Expectation of lower policy rates going forward has already led to a rally in benchmark 10-year government bonds. Yields on 10-year government securities (G-secs) have moved from levels of 9% in November to around 8.2% now. The Reserve Bank of India (RBI) last month cut the cash reserve ratio and said that going forward focus will shift to aiding growth rather than managing inflation. After steady monetary tightening through 2010 and 2011, many fund managers are now expecting RBI to cut policy rates or continue its pause in the months ahead. This, in turn, could aid a further rally in bonds across different maturity periods. Thus, we are seeing higher average maturities or increase in exposure to relatively longer maturity bonds across income funds and even MIPs. Should you consider MIPs now? 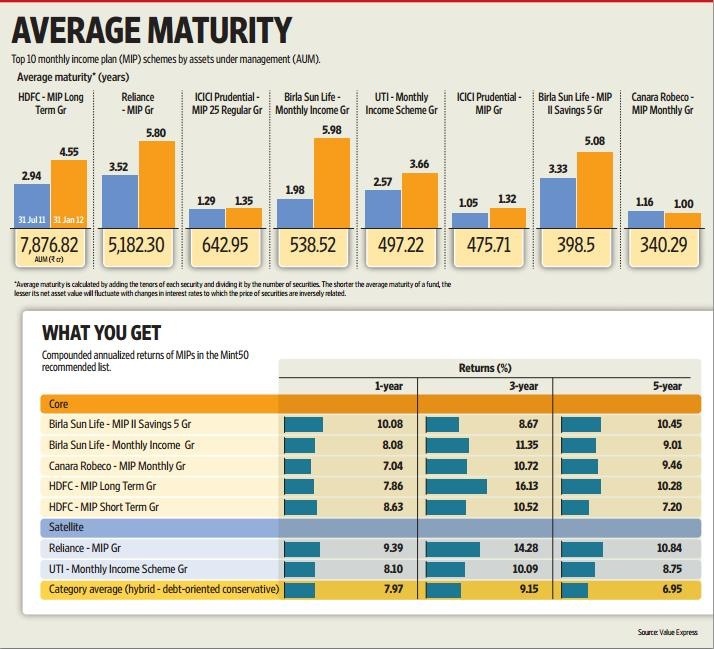 With positive sentiment both in equity and fixed income, risks notwithstanding, a product like MIP is poised to deliver good returns in 2012. Does this mean you should jump in and buy? Yes, you should buy an MIP, but advisers and fund managers caution that these are not opportunistic products and are meant for long-term investing, where you should not simply chase returns but look at overall long-term portfolio allocation. Agrees Balasubramanian, “Investors need to review portfolios from time to time but not for redemption, rather with a goal for rebalancing. That’s where hybrid products can fit into an investor’s overall portfolio, especially since the rebalancing is done by the fund manager.” Such products are best suited for investors looking for a comprehensive solution, which takes care of safety, liquidity and return participation. In case of MIPs, risk is minimized by fixed income and participation in additional returns is taken care of by equity exposure. If you decide to invest in MIPs, keep in mind key aspects such as asset allocation, whether dividend payouts are regular (monthly or quarterly), credit quality of fixed-income portfolio and performance track record.